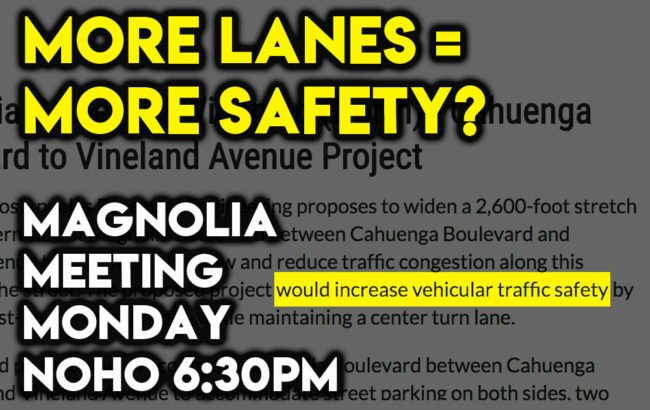 Two months ago, I learned that the Department of Engineering was planning a widening of Magnolia Boulevard covering a mile from Vineland to Cahuenga to add an extra lane of eastbound traffic. The project claims to “increase vehicular traffic safety”, but other than those four words printed once, there is zero evidence provided to back these claims. There is no mention how this widening will effect the safety of those who walk and bike, but no doubt this will worsen it. By their own study, traffic along Magnolia at the major intersections of Vineland and Cahuenga will get the same bad grades whether this project is built or not. On the same study, it will improve speeds in the middle of the project….right in front of a Senior Center! This project goes completely against Vision Zero. Thanks to Elizabeth Chou of the Daily News for helping to follow up on this and as a result, the initial comment period got pushed back and now there will be a presentation this next Monday at NoHo Neighborhood Council’s last meeting of the year (UPDATE: 6:30 PM – North Hollywood Senior Center, 5031 Tujunga Ave). A lot of people I’ve talked to are just as pulsating angry that such a project spending millions of dollars is even being considered that will only endanger more lives and not even change traffic. That’s why to please have your voice heard Monday or please send in your comments as you can be doing something to help make our streets safer.